This is THE big deal at the moment in this house. More so than Paw Patrol, and that’s really saying something. On looking at it initially, it’s got all the toddler-love package: cars, music, racing, bright colours, more cars. (And of course, a growing merchandise line, but lets just ignore that for now). However, it was listening to the show in the background that made me realise just how educational the content is, in a way that isn’t as in your face as the Sesame Street type educational show. Songs about magnets, about gravity, buoyancy, friction and various other concepts from any good STEM curriculum are sung along with, so I’m hoping it sinks in as they get stuck in my head! Again, it’s another example of a show where you do have to ignore the “Where are the adults?? ?” questions in your mind but it’s great for teaching STEM concepts to small kids while keeping them entertained. Ah, maths, what child doesn’t love maths? Well, taught the way it is in schools, a fair amount, so perhaps a different approach is needed. Enter Team Umizoomi. “Team Umizoomi” consists of 6-year-old Milli, her brother Geo, who’s 8, and their friendly robot named Bot. These mighty math superheroes introduce young viewers to the concepts of counting, measurement, shapes and patterns. Milli and Geo help other kids in Umi City with their problems, which are sent to them via the Umi Alarm. Yay for teamwork. This one hasn’t become a hit in this house yet but speaking to other parents, it’s a hit once they get a bit older so I hold out hope! More Maths, I swear I’m not on a search to make my child a Mathematical Genius. With an insanely catchy theme tune, and all of the bright kids, this one is definitely a making-learning-fun show for preschoolers. We’re not talking algebra, more like shapes, numbers and the basics, but it’s definitely a whole lot more fun than workbooks and other less colourful methods! This has been an obsession of the small man for the last year. He’s fire engine mad. I’ve spent many a day lamenting the realism of Norman not being sent to a young offenders centre, or the likelihood of such a large fire service for such a small population. However, it is great for teaching different things like fire safety and the importance of team work. This one is a Netflix original, perfect for kids who have endless questions about the world around them. Answering questions like “Why does Night Happen?”, “How do Airplanes Fly” and “Why Do I have to Brush My Teeth”, this one is perfect for inquisitive kids, and for adults looking for the easiest ways to explain complicated concepts! Each episode is around 20 minutes. Favourites from childhood like Elmo and the Cookie Monster are back with a new series developed for CBeebies called The Furchester Hotel. It’s a British Spinoff of Sesame Street so you can expect the same fun but educational experience. Episodes are 11 minutes long each. The Furchester Hotel is a half-star hotel that is owned by a monster family called the Furchester-Fuzz Family. The Furchester-Fuzz Family alongside Elmo and Cookie Monster figure out how to solve different issues that are developed by the guests of the Furchester Hotel. If your kids have an interest in space, then this one may just be right up their alley. Following the adventures of the Stardust Space Academy cadets, the series focuses on scientific exploration and investigation along with the importance of cooperation. With fun and engaging characters like Eagle, the leader of the Space Racers, and Hawk, the big spaceship with an even bigger heart, “Space Racers” aims to excite children about the wonders of the solar system, as cadets use their skills and work as a team in accomplishing missions. This cartoon for preschoolers takes two elements young children often find fascinating — mythical animals and monster trucks — and combines them to create a different kind of action hero. The mechanicals are comprised of Rex, Unicorn, Komodo, Sasquatch and Mouse, five friends with the power to transform themselves into various shapes, which comes in handy considering the world in which they inhabit is also a “snap-together-take-apart” kind of place. Each episode, the mysterious Island Owl appears to send the team on a specific mission. It doesn’t take long for the Animal Mechanicals (and young viewers) to then decide who among them is best suited to tackle each of the many challenges that pop up during their adventures. It’s a classic. How could any list not include it? Initially shown between 1994 and 1997, it’s definitely a lot less current-tech than some of the others on this list. However, it’s still a great kids show with educational content. Again, it was developed around increasing the amount of STEM education for kids, in particular little girls. “The Magic School Bus” follows Ms. Frizzle and her class as they set off on field trips. Based on the best-selling book series of the same name, “The Magic School Bus” takes kids on a virtual bus ride. Magically transforming into a plane, submarine, spaceship or surfboard, this bus carries Ms. Frizzle and her students on super adventures and teaches them about science.A revival has been announced by Netflix and is currently in production, so it’s yet to be seen just what lies ahead for the Magic School Bus in this new tech era, but catch up on the older episodes while you wait! So, next time your kid is asking for “Just one more episode”, just think of the learning potential and give yourself a break. 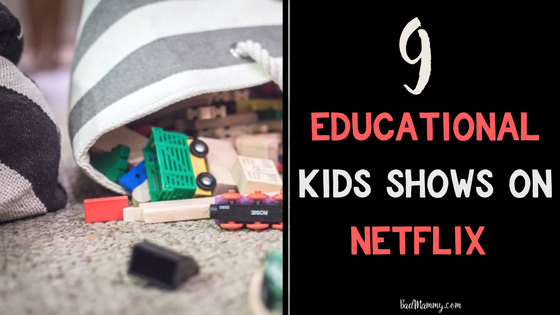 There’s lots to learn in fun ways out there, and these are just nine examples of the educational content suitable for small kids on Netflix. Have you got any recommendations for kids shows that teach them while they watch? What are your thoughts on educational TV? Let me know in the comments below! BadMammy is over on Facebook talking toddler tantrums, educational tv and everything in between,.